Alcohol is a carcinogen, but then many things that we put into our bodies are. You have to balance your lifestyle, what makes you happy, what feeds your soul, with what's 'good' for you. For some of us that's going to be a glass a day, for others, only at Christmas or the like. The science is in on alcohol consumption being a risk factor in developing a breast cancer (it is), but I don't thing there have been studies done on recurrences. I'd be fascinated to know if it's been looked at. I've cut down a lot. I have a glass or two on two days a week, and special occasions, but I am no longer a daily drinker. 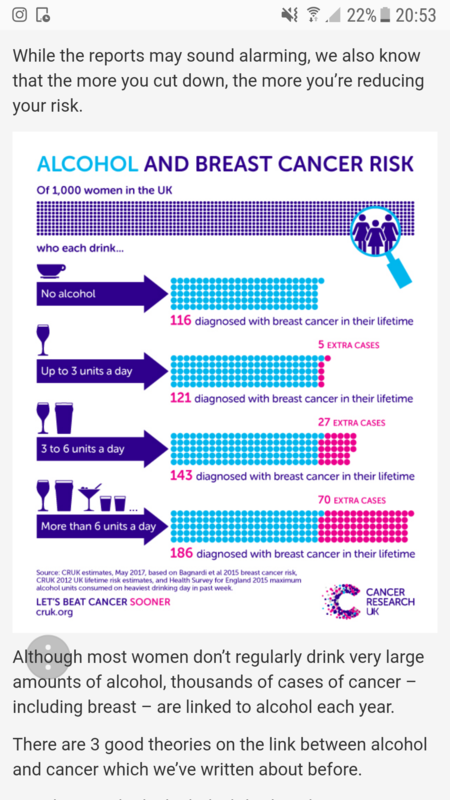 Not that it proves anything either way, but I gave up alcohol completely for a year in 2017, only to be diagnosed with a fast growing breast cancer in February this year! My mum was a very infrequent tippler (and in addition she breastfed four children) and still succumbed to breast cancer in early middle age. It will not cause breast cancer, but it does raise your risk. As do several other known factors, and as Mel says, many as yet unknown. Some studies say 1 glass of red wine is protective....sigh. So confusing. So I'm just sticking to tbat about 4 days a week. I have no breasts now and really do enjoy my red wine. I was never a heavy drinker pre bc. Actually I think I might have more now. I asked the onc about alcohol earlier this month. He replied that he reads every study in the vain hope that something will show that alcohol is good for you. However, he did say that as far as he can tell from the research, drinking in moderation is fine - the problem comes with a drink every day that becomes two drinks every day, etc. How to define the thin line is what is difficult. My husband is convinced that alcohol is the cause of cancer even if he doesn't necessarily say so. Did anyone watch the 60 minutes segment last night? I didn't but wondered what their spiel was. @kmakm That report would be interesting to read. It appears that it is based on the heaviest drinking day rather than regular drinking - I wonder if that's factored in? Crumbs @melclarity there must be gremlins afoot as I have just read your post.I have no idea how I managed to LOL your post and have removed it .My sincere apologies that this happened.The only thing I can think of is I may have accidentally hit LOL as I remember seeing Kate’s table .My only excuse is I am quite vision impaired following eye surgery and need the magnifying support of my tablet to be able to read/comment atm and unfortunately may have touched LOL on your post. I did that the other day on fb! Very serious post and I hit the laughing emoji...didn't realise until afterwards and was mortified. My hubby doesn't eat junk/fatty food, doesn't drink & has exercised 3 times a day since age 12-82 (he has been a World Class Athlete & Triathlete.) He got stomach cancer & had to have most of it removed - quite ironic, I thought! I enjoy a couple of wines with my dinner. Am so embarrassed and upset - I’m not even sure how I knew that @melclarity tagged me as not in my notifications - thank goodness I found it. Mel’s tag appeared in an email but not on my blog page.I tend not to read emails from the blog relying on it appearing on the blog page as is duplication usually.Is the second time this week I have missed a post because of it.